Skunks and racoons on the kitchen table? 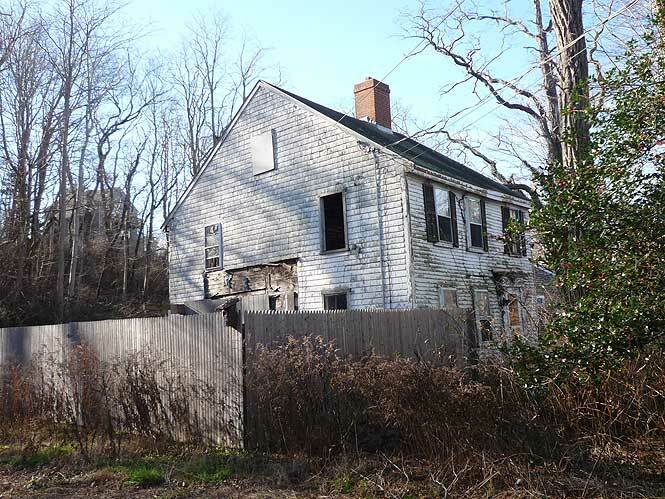 The house at 238 Route 6A, The Old King’s Highway, is falling down. It’s open to the weather and the rain just pours in. In a year or so, it may be gone. 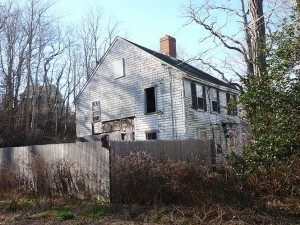 Sad, because so much took place here–so much that is now part of Sandwich’s rich history. 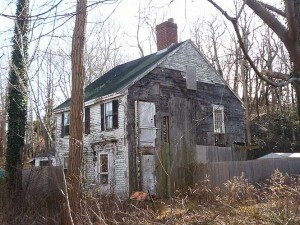 This house was built around 1770 by Peleg Nye II, a direct descendant of Benjamin Nye, one of the founders of Sandwich. Later it was occupied by the Cooke family who were double Mayflower descendants, being in straight lines of both Cooke and Conant. 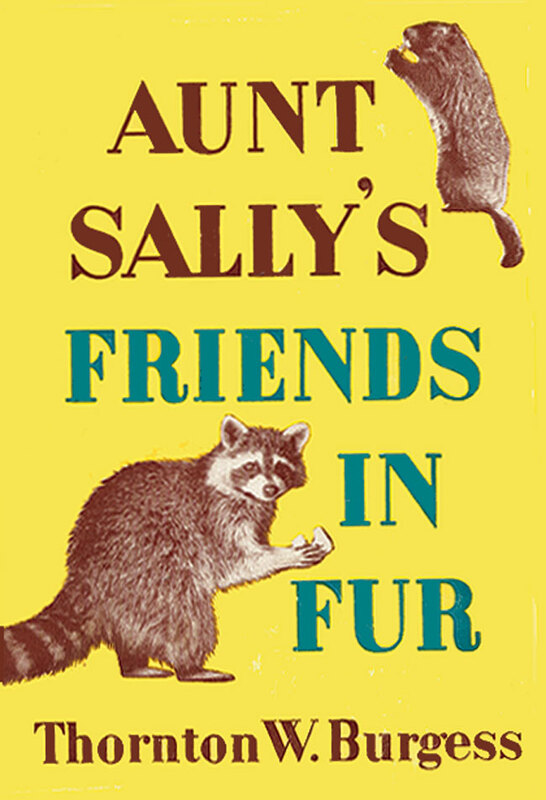 In the early 1900s it was occupied by skunks, racoons and Alice, Abby and Mary Cooke. (It was also an insane asylum called Locust Grove, but more on that later). Historian R. A. Lovell wrote that Alice, Abby and Mary “all lived in a consciously archaic fashion; they were abstemious, prohibitionist and vegetarian.” Mary (who preferred to be called Minnie) became an expert photographer; her stereopticon views of Sandwich scenes were popular in town. Her photo of Town Hall can be seen HERE. All three ladies had a profound respect for the sacredness of life. They found it impossible to kill even rats and mice. Over time, an unusual collection of skunks, raccoons and woodchucks came to the old woodshed connected to the rear of the house and even came into the kitchen and up onto the table. Abby, Minnie and especially Alice enjoyed feeding and entertaining them. It so happened that Alice had known the naturalist and author Thornton Waldo Burgess (1874-1965) when he was a boy in Sandwich. He worked nearby for William C. Chipman shipping water lilies from local ponds (see below). Alice was aware that the woods and pond behind her house were the genesis for Thornton’s nature stories that began to appear after 1912. She was a trustee for the new Sandwich Public Library for many years and made sure the library had a Thornton Burgess collection. Burgess went on to introduce the story of the “animal nightclub,” the woodshed and Aunt Sally in his newspaper column and to thousands via the Radio Nature League carried over numerous radio stations including WBZ in Boston and WBZA in Springfield where Burgess lived at the time. 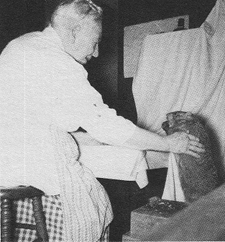 The Sandwich Historical Society has related photographs, an oil painting and the original manuscript of the Aunt Sally book. Besides caring for animals in her home, Alice also cared for the disabled. She entered into a formal agreement with the Massachusetts Board of Lunacy and Charity to care for three “deranged” women at her home. A state inspector later mistakenly tried to remove the women, but Alice was ably defended by town selectmen and in 1895 was formally licensed to open a mental hospital at 238 Rte 6A and keep and treat insane female patients there. She named it the Locust Grove Asylum. In 1930 it’s just Alice, Mary and 1 private servant. (Their mother lived to be 100: born in 1822, she died in 1922.) There’s no longer any mention of an asylum or sanitarium. Mary (AKA Minnie), born in 1854, died in 1932 causing a deep sense of loss and grief to her sister. On a sudden impulse Alice burned Minnie’s papers and many of her photos in a tragic farewell salute. Alice kept up the animal nightclub until 1947. She died in 1956 and left much of her property to the Cahoons, who had helped supply food for the animals. The Cookes are all buried in the Cedarville Cemetery at Route 6A and Ploughed Neck Road. 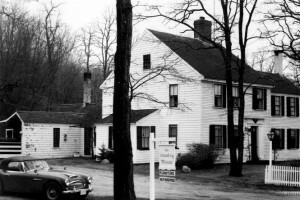 In the 1970s the property was owned by Capt. 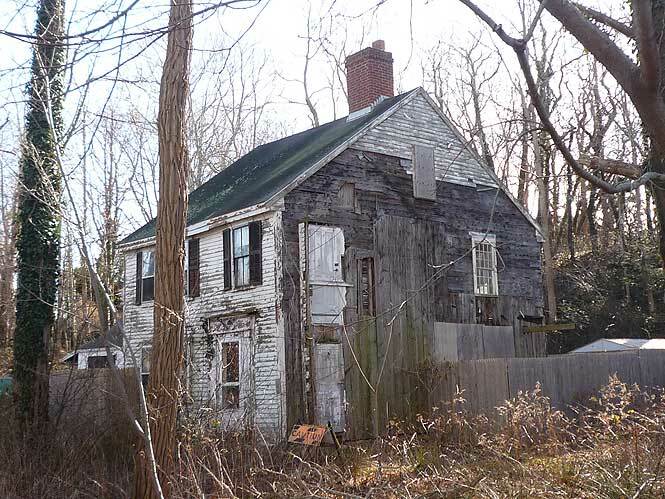 Colin H. Bell and was used as a furniture refinishing business called “The Country Mouse.” Today the rains pour in and we may soon lose the place where fascinating chapters of Sandwich’s history were created. Born in Sandwich in 1874, Thornton Waldo Burgess was the son of Caroline F. Haywood and Thornton W. Burgess Sr., a direct descendant of Thomas Burgess, one of the first Sandwich settlers in 1637. Thornton W. Burgess, Sr., died the same year his son was born, and the young Thornton Burgess was brought up by his mother in Sandwich. They both lived in humble circumstances with relatives or paying rent. As a youth, Thornton worked year round in order to help support himself and his mother. Some of his jobs included tending cows at Town Neck; delivering milk; picking and selling dandelion greens, arbutus, beach plums, wild grapes and blueberries; selling candy made by his mother and trapping muskrats. He also picked cranberries in September; school did not open until October in Sandwich to allow whole families to take part in cranberrying. Burgess also worked for William C. Chipman, a pioneer grower of pink pond lilies. He had a series of small artificial ponds fed by a stream of spring water. The young Thornton would reach the lillies with a long slender pole that had a knife blade set at an angle at one end for cutting the stems. The mature buds, just ready to break open, were cut, graded, packed in sphagnum moss and shipped to florists all over the country. There was no telephone so Burgess was paid fifteen cents to take Mr. Chipman’s mail and telegrams to the post office in town. The walk, sometimes twice a day, was three miles roundtrip. Chipman lived on Discovery Hill Road, a wildlife habitat of woodland and wetland. This habitat became the setting of many stories Burgess would write referring to the Smiling Pool and the Old Briar Patch (now part of the Green Briar Nature Center). Graduating from Sandwich High School in 1891, Burgess briefly attended a business college in Boston from 1892 to 1893, living in Somerville, Massachusetts at that time. But he disliked studying business and wanted to write. He moved to Springfield, Massachusetts, where he took a job as an editorial assistant at the Phelps Publishing Company. His first stories were written under the pen name W. B. Thornton. Burgess married Nina Osborne in 1905, but she died only a year later, leaving him to raise their son alone. It is said that he began writing bedtime stories to entertain his young son, Thornton III. 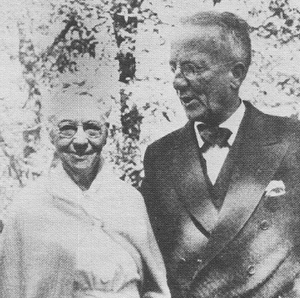 Burgess remarried in 1911; his wife Francis (Fannie) had two children by a previous marriage. 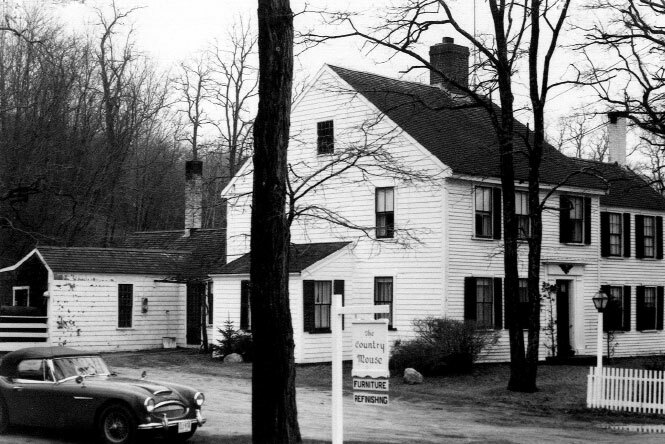 The couple later bought a home in Springfield, Massachusetts which became Burgess’ permanent residence in 1957. His second wife died in August 1950. Burgess returned frequently to Sandwich, which he always claimed as his birthplace and spiritual home. Many of his childhood experiences and the people he knew there (such as Alice Cooke) influenced his interest and were the impetus for his concern for wildlife. By the time he retired, Burgess had written more than 170 books and 15,000 stories for daily columns in newspapers. He died in 1965 at age 91. For more information, read Nature’s Ambassador: The Legacy of Thornton W. Burgess, by Christie Palmer Lowrance, released in June, 2013. Lovell, Russell, Sandwich, A Cape Cod Town, Town of Sandwich Archives and Historical Center. William S. Sullwold Publishing, Inc. Taunton, Mass. 1984. pp. 490-494. Scully, Francis X., Sage of Sandwich Wrote Over 15,000 Animal Stories, Books, Bradford Era, 24 February 1977, p. 16. This entry was posted in Early Settlers, Historic Buildings. Bookmark the permalink.